I found this interesting article Taking charge of dyslexia in the workplace through www.btob.co.nz. 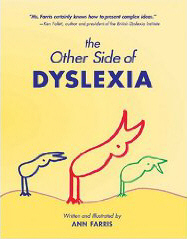 It originated from the Dyslexia Foundation of New Zealand, www.dyslexiafoundation.org.nz. Enjoy. Shame is a powerful emotion. And so is fear. You may think they are uncommon feelings in the workplace, but right now there is a one in 10 chance that a colleague is experiencing these disabling emotions. And the reason? Their dyslexia has been misunderstood, particularly at school, resulting in life experiences that have challenged their self-esteem and identity. To those of us who might take for granted our ability to peruse a report or express our ideas in an email or document, it is hard to imagine how these seemingly simple tasks can produce such an emotive reaction from so many dyslexic people. But for those whose dyslexia has been misunderstood either in school or elsewhere in their life, the feelings are very real, and understandable. Richard Taylor, co-founder and co-director of the Weta companies, regularly comes into contact with people struggling with the feelings dyslexia evokes. “Only a few weeks ago I met a young man whose parents brought him to the workshop to see what we could do. He had been labelled in degrading ways in terms of his ability, when actually his motor skills, visual and creative skills were amazing. “It’s tough at that age, but what I tried to make him understand is how important it is to believe in his own unique capabilities. When he leaves school it will become apparent that he is actually in a unique position to make the most of his exceptional creative view of the world,” he says. The story is just one of many that Taylor offers when talking about dyslexia, a topic he is deeply passionate about, and its sentiments are echoed by other high profile New Zealanders who experience dyslexia. “I hid the fact that I had issues with writing and spelling for 37 years, out of shame and fear of being judged a dummy, an idiot, lazy or stupid. At high school, to cover up my issues I just pretended I didn’t care and teachers told my parents I was lazy and didn’t try. You get the picture,” says Paul Reid, CEO of the New Zealand MetService. Fortunately, for young New Zealanders and those already in the workforce who have dyslexia, a global step-change in thinking is underway. Instead of pigeon-holing dyslexia as a disability, the new thinking focuses on increasing understanding which helps employers to notice the difficulties (or preferences) a staff member has and to adjust their actions in response. This simple “notice and adjust” approach empowers employees to achieve their potential and demonstrates an employer’s willingness to support genuine needs. This leads to increased job fulfillment for dyslexic employees, and for the employer, an enhanced bottom line. At its essence, dyslexia is the disparity between thinking skills (which are usually strong) and basic skills such as reading and writing (which can often be weak in comparison). This is a consequence of how the brain is wired, and a strong preference as to where it processes information. In fact, leading dyslexia researcher Sally Shaywitz, founder of the Yale Center for Dyslexia and Creativity has shown that dyslexics tend to have strengths in higherlevel thinking processes, learning capacity, creative problem-solving, thinking ‘outside the square’ and empathy. She also found that dyslexics excel when focused on highly specialised areas, ranging from medicine and law to science and architecture. Dyslexics also have great skills in entrepreneurialism. Research from the United Kingdom shows that 35 percent of US entrepreneurs and 20 percent of UK entrepreneurs are dyslexic. With such strengths to offer, the challenge for New Zealand employers is to find the right way to harness the potential benefits. For Taylor, the emphasis for a good employer needs to be on changing their approach to working with dyslexic employees in order to help them flourish. “You need to identify exactly what attributes you want in the person you hire. If you expect a more traditional, linear thinking mode you will need to put more support around a dyslexic person to help them achieve that. “Awareness is critical. You need team leaders who can identify the signs of dyslexia and make simple adjustments so the employee feels valued and empowered. This will involve good peer support and making sure that the challenges you set dyslexic employees are testing, but not outside the realm of their capability,” he says. These sentiments are echoed by Reid. “Dyslexia has helped me be a good leader because I’ve learnt to communicate ideas, issues and concepts in different ways. I have had to adapt to succeed but I believe this has actually made me a stronger leader,” he says. Reid believes that business owners or employers need to rethink traditional principles and rules to help dyslexic employees, and to allow them to help themselves. “Employees with any form of dyslexia can be of great use to organisations as long asyou don’t put them in the wrong job and expect them to undertake tasks that they cannot perform. It’s about horses for courses and matching skills to strengths. Reid says many dyslexic adults can work very hard at hiding their weaknesses, instead of using their significant abilities to add value to the business. Employers can lift productivity by helping them identify, and play to their strengths. “It’s great to see a new model emerging that is based on attitude, where knowing the questions to ask is more important than knowing the answers, and where people areconstructively speaking out. Good communication and understanding strengths and weaknesses is essential for supporting employees, especially those affected by dyslexia,” he says. • Attitude is everything, and it counts from top to bottom. Make an effort to understand the strengths that Dyslexia can offer and do not confuse weakness in basic skills with a lack of intelligence, ability or commitment. • Accept the challenge to review your company style guides and fine tune them to suit the needs of dyslexic people. It’s not only them who benefit, everyone gains when things are communicated in a way that is clear, concise, well-planned and combines a mixture of words and visuals. • Value visual information as well as the written, and include diagrams and pictures in presentations and reports. • Always give an overview and explain the big picture. • Ask for ideas verbally in meetings instead of always seeking written responses. • Ensure support structures are in place for dyslexic employees if you expect themto deliver work in a traditional, linear fashion.